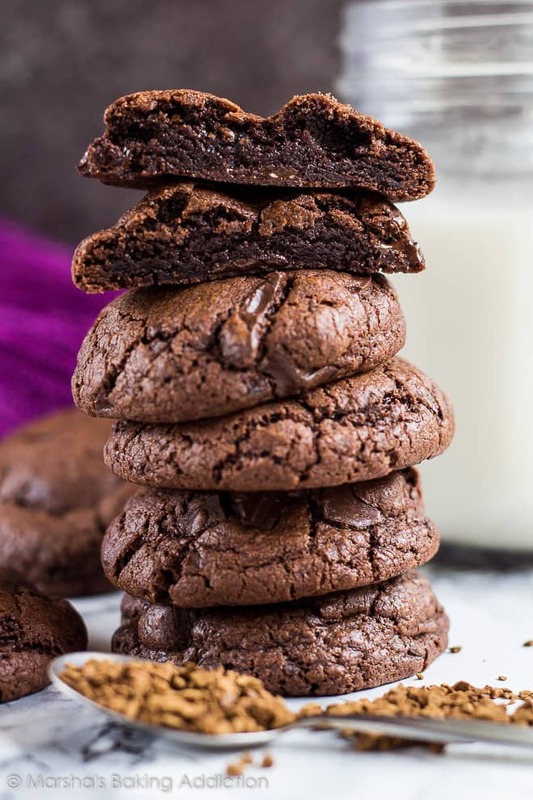 Chocolate Chip Mocha Cookies – Deliciously soft, thick, and chewy chocolate cookies infused with coffee and studded with chocolate chunks. No chilling required! I’m all about mocha right now, and not just in drink form. 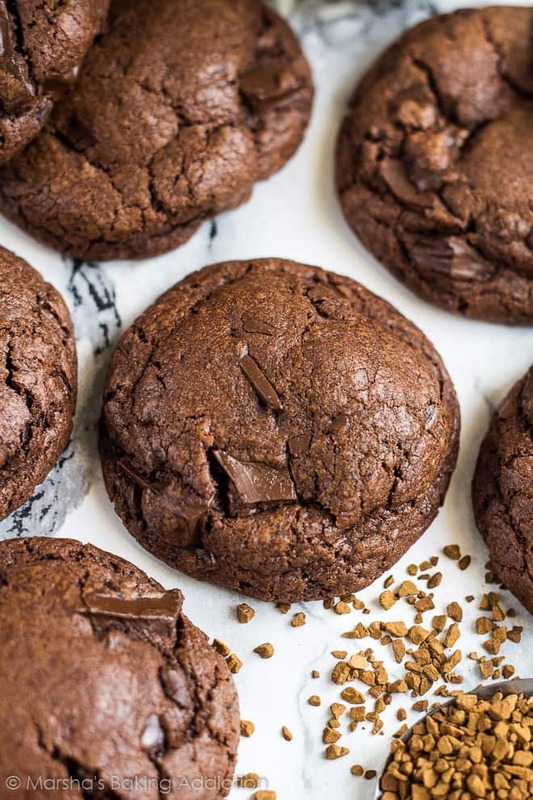 The flavour of chocolate and coffee is incredible in cookies, too. 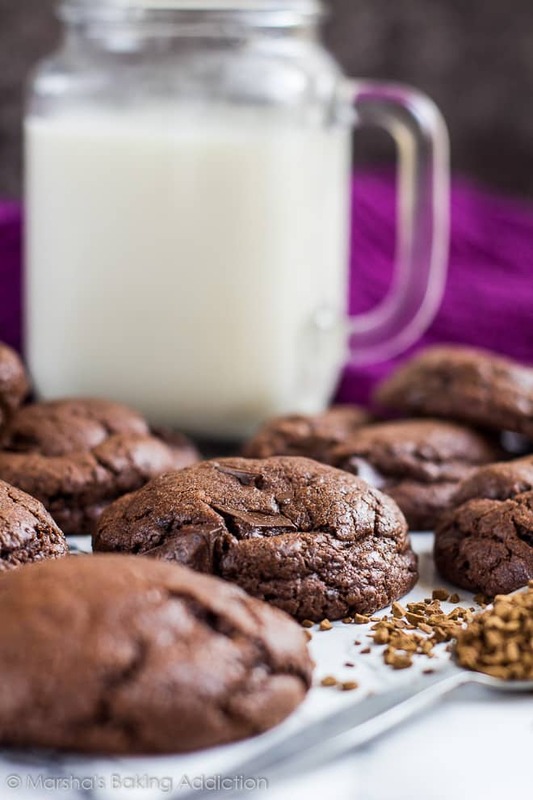 So, today I’m bringing you my Chocolate Chip Mocha Cookies! These cookies are slightly adapted from my Chocolate Chip Coffee Cookies, my brother’s all-time favourite cookies. I’ve added cocoa powder, and a little extra cornflour for a thicker cookie. 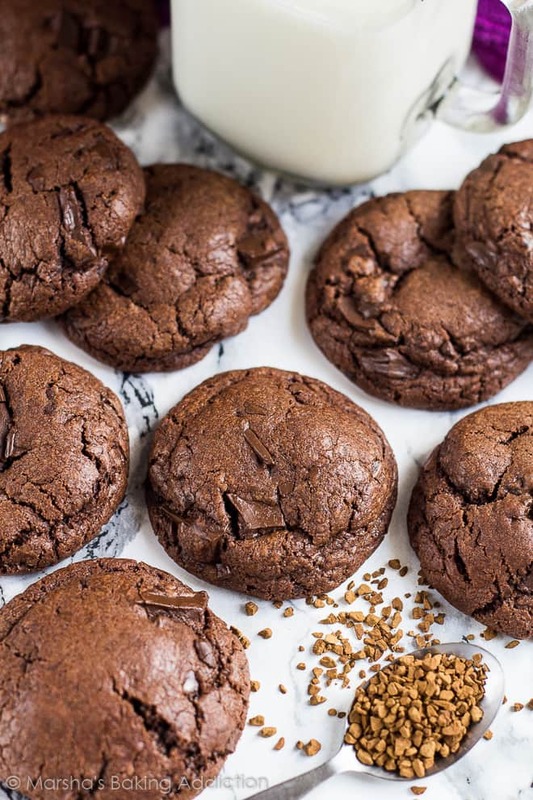 I chopped up chunks of dark chocolate for these cookies, but you can use chocolate chips! 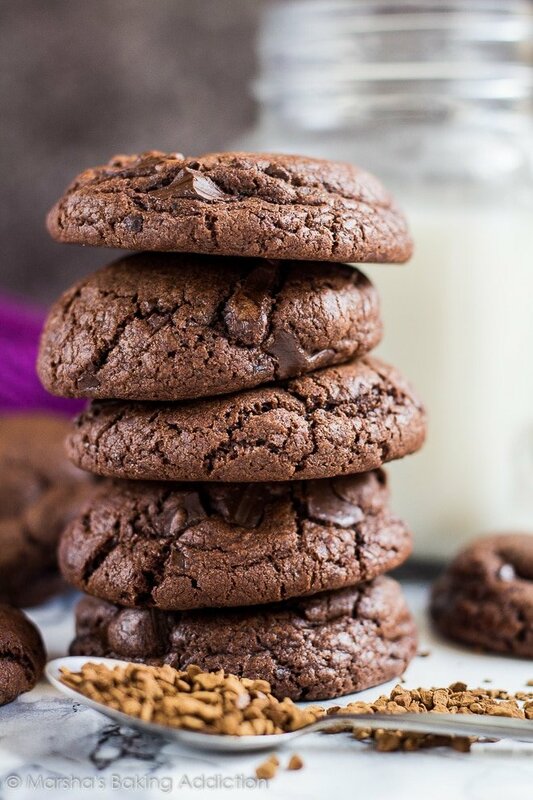 Deliciously soft, thick, and chewy chocolate cookies infused with coffee and studded with chocolate chunks. No chilling required! Whisk together the flour, cocoa powder, baking powder, baking soda, cornflour, salt, and 2 tablespoons of instant coffee granules. Set aside. Whisk together the butter and sugars until combined. Add the egg, and mix until combined. Dissolve the remaining 2 tablespoons of instant coffee granules in 1 tablespoon of hot water, then add to the wet ingredients, and mix until combined. Roll the dough into 1.5oz balls, about 17 balls, place on the prepared baking tray, and press the extra chocolate chips on top. Bake for 10 - 12 minutes. Do not over-bake. Allow to cool on the baking tray for 5 - 10 minutes before transferring to a wire rack to cool completely. *Use a coffee you absolutely love to drink! The taste is everything in this recipe. If you'd like a weaker coffee taste, skip the 2 tablespoons of coffee in the dry ingredients. You can never have too many mocha recipes. That combination of chocolate and coffee is so good! And I really like that you cut up dark chocolate for these. They sound wonderful! I like chewy cookies and yours look so good. I also love that it takes less than 30 minutes to make them! Hi Marsha! 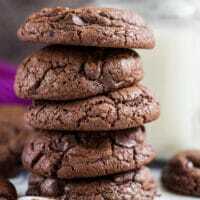 This is the first I’ve come across your lovely blog..and lookie there..you are sharing a cookie recipe. I am a Cookie Monster for sure. I’m Marsha Baker..author of The Better Baker blog..a play on my last name. Thanks for sharing this awesome cookie…I love coffee..and love it in my cookies. Stop by and visit me sometime… http://www.thebetterbaker.blogspot.com. I definitely have a baking addiction also. Found your recipe on Pinterest. I didn’t have any cookie scoops so I found how to convert your scoop size to teaspoons. Decided to make 1 inch balls like I usually do. Good thing I test baked 6. They barely flattened out! The rest of the balls got flattened with the bottom of a glass and then extra chips. The taste was great! The perfect birthday treat for the male business owner across the street! Thank you for sharing! I just took your amazing cookies out of the oven & they are perfect! I am an old lady so I’m not posting a photo but they look just like yours. I found this just doing a random mocha search & hit the proverbial jackpot with these cookies. Incredibly easy to make & doesn’t require a pound of butter. When I was teaching, I used to drop a Hersheys Kiss into my coffee and got this same flavor. Thank you so much. My family will love these. I just tried your recipe, and I was disappointed—mine didn’t come out at all like you described. Definitely cakey. 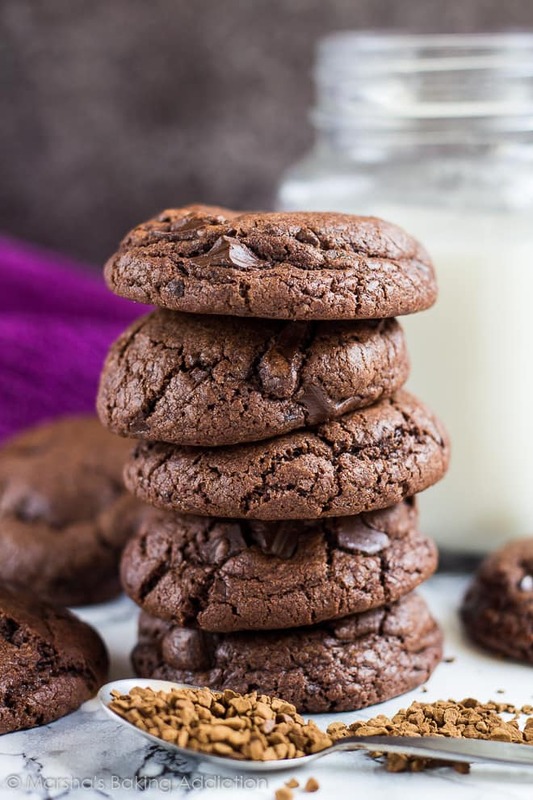 I’ve been looking forever for how to make chocolate cookies that are chewy and not cakey. Mine also had a *very* faint burned flavor at the first taste of the outside, and they started to smell a bit burned before I took them out, although I’m sure I didn’t overbake them. (The second batch I only left in for 8 minutes.) I did make them smaller than yours, so that might be part of it, but I doubt it’s the whole story. I also would like to know what brand of coffee you use. The only thing I had on hand was “Via” (from Starbucks – little packets of very fine granules that make a very dark coffee). Overall, I thought the recipe could use more sugar, and I *never* say that! I love a cookie that’s not too sweet, but it might be because of the very dark (=bitter?) coffee. Do you pack the brown sugar tight or loosely, or not at all? Thanks for any additional advice. Hi Beth – I’m so sorry they didn’t turn out for you! These definitely sound like they may have been baked on a higher temperature. I always recommend using an oven thermometer, as ovens are not all accurate (I was surprised with mine!). I use a coffee that we all love to drink – we love the brand Nescafé (Original, Gold, etc). I’m assuming the very bitter coffee overpowered the sweetness of the cookies, making them seem like they needed more sugar. I weigh out my sugar, I don’t use cups. But if you’re using cups, pack the sugar. OK, tried again a week later. Used a different kind of coffee, an extra egg yolk, weighed the brown sugar so I’m sure I used more this time, and only baked them 8 minutes. Definitely better this time, but still not as chewy as I had hoped, and they are hardly spreading at all either. Do you think using a tad less flour might help? Anyway, they are REALLY good!! This is already a new favorite. Thanks! I will definitely be trying again. I love this recipe!! I was wondering if you melt your butter before you mix it with the sugars. Or can the butter be left at room temperature before mixing? These cookies turned out delicious! They were a big hit! Thanks so much for sharing the recipe. 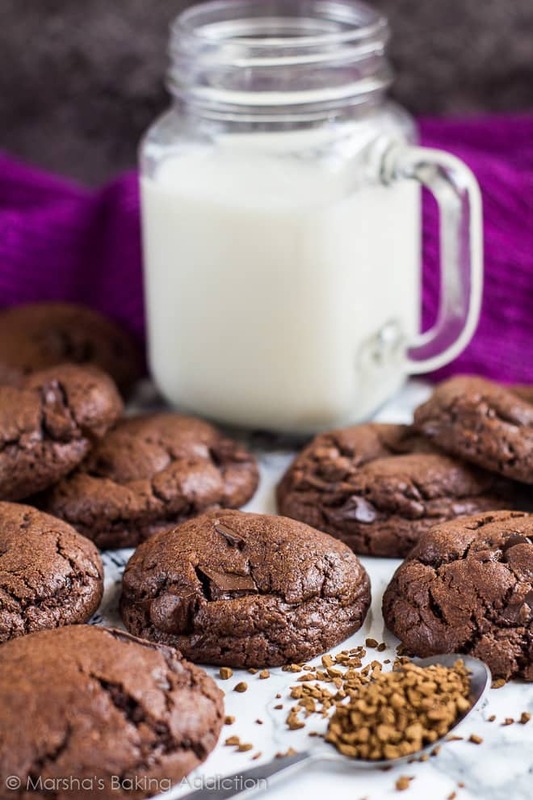 I want to try to use this recipe to make chocolate chocolate chip cookies (without the coffee). Why do you add the 1 tbsp of hot water? Is that because of the coffee granules or is it for another reason? I didn’t know if I should add the water if I’m removing the coffee granules. Thanks so much! Hi. I love most of your recipes. I don’t eat eggs. So can I use flax eggs instead of eggs?